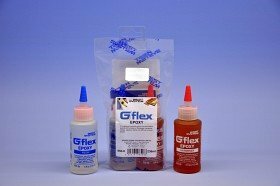 G/flex® epoxy is a toughened, resilient two-part epoxy engineered for a superior grip to metals, plastics, glass, masonry and fibreglass as well as wet and difficult-to-bond woods. It allows you to make structural bonds that absorb the stresses of expansion, contraction, shock and vibration. The easy-to-use 1:1 by volume mix ratio (1.2:1 by weight) of G/flex epoxy provides a 45 minute pot life and a long open time of 75 minutes at room temperature. It reaches an initial cure in 3–4 hours and a workable cure in 7–10 hours.